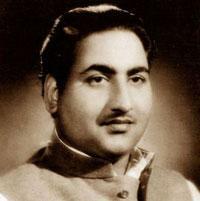 Muhammad Rafi (1924-1980) was an amazing Indian vocalist. He was one of the leading playback singers of the Bollywood film industry. He was also a great ghazal singer. He was the recipient of the National Film Award, Best National Singer Award and six Filmfare Awards. In 1967, he was honored with the Padma Shri award by the Government of India.